On Purim we are obligated to give matanot l'evyonim מתנות לאביונים - "gifts to the poor". The more common word for a poor person is ani עני, and the etymology is clear: it derives from the root ענה meaning "to humble, oppress, afflict" and is related to such words as anav ענו - "humble", taanit תענית - "fasting" and inui עינוי - "torture". But what is the origin of the term evyon אביון? The midrash in Vayikra Raba (34) provides the following etymology: אביון - שמתאב לכל "evyon - because he longs for everything". Steinberg provides a similar origin - he relates it to the the root אבה - "desire", which is related to the root תאב that the midrash brings. He also connects אבה to the root אוה, of the same meaning. From that root we get ta'ava תאוה "longing, passion". Probably from אבה and originally meaning "desirous, longing, yearning', compare Ugaritic 'bjn. Late Egyptian and Coptic ebien are borrowed from Hebrew. Kaddari doesn't even accept Klein's theory. He says the Hebrew evyon is borrowed from the Egyptian ebyen - "wretched". He says the attempts to connect evyon with אבה are not convincing. When my bilingual six year old is offered a drink at kiddush, she would like to know if it is grape juice or "wayin". She obviously senses the similarity between the Hebrew yayin יין and the English "wine". Are the words related? According to most scholars, yes. What isn't clear is how. The Hebrew yayin is clearly related to the other Semitic words - Ugaritic yn, Arabic wayn, Akkadian inu. The Indo-European words are also connected - Greek oinos, Latin vinum, Albanian vone, Armenian gini - as is the English word "vine". The words are all similar enough - what isn't clear is if the Semitic borrowed from the Indo-European, the Indo-European borrowed from the Semitic, or both borrowed from somewhere else. A popular theory is that wine making began in the Caucasus - in modern-day Turkey and Armenia, and the word originated there, perhaps the Hittite wiyana. There are those that connect this fact to the first story of wine in the Bible - Noah's planting a vineyard after landing on Mount Ararat, which is in that region (Bereshit 9:20). And what of my daughter's wayin? According to Kutscher, this was probably the earliest Semitic form of the word - וין. Why did it change to yayin in Hebrew? Because of a general rule in Hebrew (as well as Aramaic and Ugaritic) that a vav in the beginning of a word becomes a yod. Arabic and Ethiopian do not have that rule, and we can see this in the Arabic word for boy - walad, which in Hebrew becomes yeled. The word medina מדינה appears in the book of Ester many times. According to Kutscher (Milim V'Toldotehen 20-21), in the Bible (Ester as well as Melachim, Yechezkel, Daniel, Ezra, Nechemia, Kohelet and Eicha) - medina, both in Hebrew and Aramaic, always (or almost always) means "province" or "district". However, in Rabbinic Hebrew, Kutscher writes that the word usually means "city". The regular Aramaic word for 'city' in both Western and Eastern dialects was medina. This was certainly true during the period of Persian rule in Western Asia and thereafter, whatever may have been the case at a still earlier date. There is no clear evidence that the word was ever used in any other meaning outside of the Hebrew territory. The borrowing by the Hebrews seems to have taken place in the way which is illustrated in countless other instances in the history of language, the new word being given a new meaning by the borrowers. Having a fixed term of their own, עיר, for 'city,' as well as the locally used קריה, they adopted the Aramaic מדינה (literally, 'place of government,' 'seat of jurisdiction') giving it the meaning 'province,' 'sphere of jurisdiction' (equally justified etymologically), for which they had no other term; this signification was very possibly suggested by an old native use in the sense 'capital city' of an administrative district, the same use which we find adopted by the Persians and employed in Egypt. Thenceforward the word meant 'province' in Hebrew-Jewish writings, until at some time in the early Christian period its use in this sense was crowded out by the regular and original native Aramaic use. So according to this theory, the word medina originally meant "jurisdiction" (from din דין - law) in Aramaic, with the sense of "city", was borrowed by Hebrew to mean "province", and then as the Aramaic influence on Hebrew grew, came to mean "city" in Hebrew as well. "Whever you find (in the Bible) the word field (שדה) it implies "city" (עיר), wherever you find city (עיר) it implies a medina ("metropolis" according to the Maurice Simon translation or "capital" according to Jastrow), wherever you find metropolis (מדינה) it implies province (אפרכיה)." For those people reading the midrash when it was written, there was a need to explain why the word medina in the book of Ester did not mean city, but rather province. We thus know that whoever settled in Yathrib and gave it its non-Arabic name of “the Medina” or “the city” were originally Aramaic speakers from elsewhere. At first this was just a local usage employed by these immigrant Medinians for their town, just as New Yorkers, when talking among themselves, call New York “the city,” too. (If you come from Philadelphia, on the other hand, you call New York “New York,” just as other Arabians went on saying “Yathrib.”) This usage must then have spread to the Arabic-speaking population of Yathrib, which attached the Arabic definite article to make it “Al-Medina” (as Arabs call Medina to this day), a form then adopted by the Aramaic speakers when they eventually switched to Arabic themselves. And it is highly likely that these immigrants were Jews from Palestine or Babylonia, both Aramaic-speaking areas in the early centuries C.E., because we also know from Arab historians that, in Muhammad’s time, three large Jewish clans — the Banu-Nadir or “Sons of Nadir,” the Banu-Korayzeh and the Banu-Kainuka — dominated the city. In addition, there were in Medina two large non-Jewish clans, the Aws and the Khazraj, whose origins were in Yemen. There is no generic term for state in the Bible or the Talmud. The Hebrew term medinah, now used for state, appears in both; in the Bible it refers to an autonomous political jurisdiction (the equivalent of a Land in German or one of the fifty states of the United States), that is, a territory under a common din (law), whose identity is marked by having its own political institutions but not politically sovereign in the modern sense. In the Talmud, the term is used even more vaguely from a political perspective, as in medinat hayam, roughly translated as some distant jurisdiction. Only in modern times did medinah come to be used to describe a "sovereign state." Both Kutscher and Torrey relate to the Greek translation of the word medina in their efforts to understand its meaning at the time. A common translation is "polis" - the Greek word for "city-state". Since the Greeks blurred the boundaries between cities and states, perhaps any translation of the Hebrew/ Aramaic medina would be similarly blurred. In any case, modern Hebrew uses both medina and "polis" - we have mediniut מדיניות - for "policy", but politika פוליטיקה for "politics". And while medinai מדינאי and politikai פוליטיקאי - are basically synonyms, medinai - statesman sounds a bit more noble than politikai - politician. What does the word timyon טמיון as in the phrase yarad l'timyon ירד לטמיון mean? The phrase means "down the drain, lost forever" - so it would seem that perhaps the word timyon relates to that. For example, this site translates Aharon Appelfeld's novel Timyon as "Abyss". Greek tameion, related to tamias (= one who distributes, dispenser, steward), originally 'one who cuts up portions for the sake of distributing them', in gradational relationship to temnein (= to cut), tomos (=piece cut off, section). Tamias is the name of the genus of the chipmunk, for it is like a steward, storing food in its mouth. From temnein we get a number of words with a component meaning "to cut", such as dichotomy, anatomy and atom. When we discussed the terms for lawyers and advocates - praklit, sanegor, kategor - we saw that all of them derived from Greek. This is not a coincidence. Prof. Dov Frimer points out in this article, that unlike the American legal system which is an adversary system, "trial by combat", where lawyers are necessary, the traditional Jewish legal system was different. Here the judge or judges were required to ask the questions of the parties and witnesses - in both criminal and civil cases, and the power of the oath was significant enough to cause the litigants to speak the truth. There was simply no need for a lawyer, who would only act as an intermediary between the judges and the truth. This is commonly translated as: "(Judges), do not make yourselves like orkhei hadayanim - lawyers." The Rambam and others explain this as meaning "Do not teach the litigants what to say in order to win your case, as lawyers do". The modern Hebrew term orech din עורך דין - would seem to originate in this early mishna. However, Kutscher does not accept this interpretation. First of all, he points out that the mishna says orchei hadayanim - not orchei hadinim. The identification of lawyers as "arrangers of din (the law case)" does not fit with hadayanim - "the judges". Kutscher then brings a number of proofs from manuscripts that the original version of the mishna was actually archei hadayanim - ארכי הדיינים. The Greek arch / arkhi means "chief" and is found in such English words as archbishop, patriarch, and architect. A number of commentators on the Mishna (some with the version ארכי, some with ערכי ) explain the term to mean "the greatest of the judges". According to them, the mishna is teaching not to act like those judges who know the law so well they don't need to study it before a ruling. Aviad Hacohen discusses Kutscher's theory in this article. By and large, he accepts the theory, although he points out that already by the times of the Amoraim, the term עורכי הדיינים had come to mean "lawyer", not judge. In Masechet Ketubot (52a and 86a) we find examples of rabbis who gave advice to their relatives about how to get money according to the law, but later regretted it, because they were acting like orchei hadayanim. "For your hands are defiled with blood, and your fingers with iniquity; your lips have spoken lies, your tongue muttereth wickedness (Yishaya 59:3)"
"Your tongue muttereth wickedness" - these are the litigants. Hacohen points out that from this gemara we can see that the phrase orchei hadayanim עורכי הדיינים cannot be referring to (the greatest of) judges, for they are third in the hierarchy - just where lawyers should be. Hacohen writes that the famous piyut read on Rosh HaShana - לאל עורך דין - L'El Orech Din - is referring to God as the greatest of judges, not a lawyer. However, later commentaries, unfamiliar with the original meaning of the word, describe God as an advocate, defending the Jewish people on their day of judgment. "ויינתן לו הרשיון (דופלום) להיות עורך דין (אדווקאט)" (אהרון יהודה ליב הורוויץ, תולדות בנימין פרנקלין פיצצאטי, ירחון "הכרמל", תשרי תרל"ב). לֹא-תִהְיֶה אַחֲרֵי-רַבִּים, לְרָעֹת; וְלֹא-תַעֲנֶה עַל-רִב, לִנְטֹת אַחֲרֵי רַבִּים--לְהַטֹּת. The phrase acharei rabim l'hatot אַחֲרֵי רַבִּים--לְהַטֹּת is often translated as "follow the majority", and in addition to being the basis for a majority rule in a court, it also is used as an early basis for democratic rule. "Do not follow the majority to do evil. Do not speak up in a trial to pervert justice. A case must be decided on the basis of the majority." You shall not follow the majority for evil There are [halachic] interpretations for this verse given by the Sages of Israel, but the language of the verse does not fit its context according to them. From here they [the Sages] expounded that we may not decide unfavorably [for the defendant] by a majority created by one judge. They interpreted the end of the verse: אַחִרֵי רַבִּים לְהַטֹת, “after the majority to decide,” [to mean] that if those [judges] voting [that the defendant is] guilty outnumber those voting [that the defendant is] innocent by two, the verdict is to be decided unfavorably according to their [the majority’s] opinion. Why is Rashi so compelled to reject the halachic approach? It would seem to be due to the teamim (the Biblical cantillation notes and accents). This site quotes Ibn Ezra as saying "that any interpretation of a verse that doesn’t agree with the Teamim should not be listened to." Pearlman then goes on to quote Mendelssohn's Biur as saying that Rashi and the Rashbam's approach is based on the teamim. One aspect of this discussion I find interesting, but haven't found anyone who talks about it, is the meaning of rabim. I think it's significant that Sarna translates "mighty", Fox and Alter use "many", and Artscroll and Kaplan use "majority". It changes the understanding of the entire verse - and perhaps knowing what the proper (earliest?) meaning of the word would provide the most authentic translation. As we mentioned earlier, kategor קטגור is a Talmudic term for "accuser, prosecutor". It appears as the opposite of praklit in Avot 4:13, and as the opposite of sanegor in Rosh HaShana 26a. Its verbal form - "to accuse, denounce" is קטרג, and developed through metathesis. In modern Hebrew neither is widely used, and instead we find the term (both verb and noun) tovea תובע for "prosecute, prosecutor". We saw other words related to agora in the post about sanegor; kata, meaning "down, against", appears in such English words as catapult, catastrophe and catalog. Original sense of "accuse" weakened to "assert, name" by the time Aristotle applied kategoria to his 10 classes of things that can be named. In ancient Greek "kategorein" is a concept of legal terminology and means the reading of a list of accusations performed in the process of charging someone. 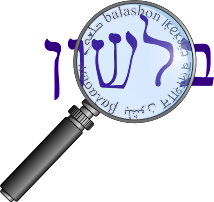 This word is clipped or rather shortened in the common idiom (kara tagar) -קרא תגר which means "call the prosecutor". I at first found this rather far-fetched. A slightly different form of tagar - tigra תגרה appears in Tehilim 39:11, and a related verb appears in Devarim 2:24, and these sources certainly wouldn't be influenced by the Greek kategor. However, my sources tell me that there might be a connection between kategor and the development of the phrase kara tagar (if not the individual words.) If anyone knows about this - please post in the comments. Otherwise I'll update the post if I find anything. So according to this Mishnah what is the difference between a praklit & a 'sanegor' which I believe is also a mishnaic word? From what I can tell, a praklit is more of a mediator, and a sanegor is like a defense attorney. Well, we're going to be looking at legal terms in the next several posts, so we may as well start with sanegor סנגור. In Modern Hebrew, a sanegor is a defense attorney, and the סנגוריה הציבורית is the Public Defender's Office. In Talmudic Hebrew, a sanegor is often shown as the opposite of a kategor קטגור - a prosecutor (we'll explore this term later). Greek synegoros ( = advocate; literally: 'one who speaks for somebody before an assembly'), from syn ( = with, together with) and the stem of agoreyein (= to harangue, assert, literally: 'to speak in the assembly'), from agora (= assembly). The Greek root syn appears in such words as synonym, synagogue, and synchronize - in which it means "together" or "same". Agora is familiar from agoraphobia - "fear of open spaces" as well as allegory (literally "speak in the assembly"). In Modern Hebrew, a praklit פרקליט is an attorney - and the State Attorney's office is known as פרקליטות המדינה - Praklitut HaMedina. However, in the Mishna, where it first appears, praklit means "advocate, intercessor", as in Avot 4:13 - העושה מצוה אחת, קנה לו פרקליט אחד - "Whoever does one mitzva, acquires a praklit for himself" and Sifra Metzora 3:3 - חטאת דומה לפרקליט שנכנס לרצות - "A sin offering is like a praklit that enters the (royal palace) to appease (the king)." It is also the translation by the Targum for the Hebrew melitz מליץ in Iyov 16:20. Greek parakletos (= advocate), verbal adjective of parakatein (= to call to aid, summon, invite, console, exhort, encourage), from para ( = beside), and kalein ( = to call), which is cognate with Latin calare ( = to proclaim, call, shout). Joel Hoffman in his book In the Beginning: A Short History of the Hebrew Language points out that Klein's entry has a typographical error, and writes that "the Greek verb "to call" from which the word ultimately derives is parakalein, not parakatein." The word made its way into English as well as paraclete - meaning "comforter", and is found in Christian and Moslem tradition. Marzipan comes via Italian from Arabic mauthaban, “seated figure.” Marzipan originally came in fancy little boxes decorated with a picture of a Venetian coin showing Jesus sitting on a throne. The candy took its name from the coin, which was an imitation of Arab coins showing a seated king, called mauthaban. The Arabic word comes from wathaba, “sit,” which is from the same Semitic root as Hebrew ישב, “sit,” or “dwell.” (Note that ש in Hebrew corresponds to two different consonants in Arabic, either s or th, just as it corresponds to either ש or ת in Aramaic. The Aramaic word for “sit” is יתב.) Derivatives of ישב include שביתה, “strike” in modern Hebrew; מושב, a cooperative community with privately owned land, moshav in English; ישוב, “settlement” or “community;” and ישיבה, “place where people sit,” hence yeshiva, or “meeting” in modern Hebrew. The Online Etymology Dictionary mentions this theory, and adds "Nobody seems to quite accept this, but nobody has a better idea." This site says that marzipan might derive from a Persian word for governor, marzuban. What, then, is the ultimate origin of marzipan (and its cousin marchpane)? The original OED entry comments that 'Its etymology is obscure', and does no more than mention one scholar as having 'ingeniously' suggested a link with 'Arabic mauthab n "a king that sits still"'. Once again, recent scholarship allows the new OED entry to put forward a new derivation: in this case Italian philologists have furnished the basis for a link with - remarkably - the Far East. In Myanmar (Burma) there is a port, near the town of Moulmein, called Martaban, which was famous for the glazed jars which it exported to the West, often containing preserves and sweetmeats. Delicacies are often associated with the containers in which they are traditionally imported (ginger being an obvious example); it seems plausible enough that a name associated with a special container should transfer its association to the thing contained. Latin marsupium ( = poudi, purse), from Greek marsypion, diminutive of marsypos, marsipos (=bag, purse), which is probably of Oriental origin. Is the word "genie" somehow related to Hebrew? Not exactly. The word "genie" comes from the Latin genius, which in Roman mythology meant a "guardian spirit". From here the word developed to "spirit, incarnation, wit, talent" and much later came to mean "person of natural intelligence or talent". But the French version of genius, genie, was used in the French translation of "Arabian nights" for jinni, the plural of jinn - "spirit" in Arabic. The Latin and Arabic words are not related, but in the past two hundred years the Arabic sense of the word genie has become dominant. And where does jinn derive from? Jinn (and majnun - "someone possessed by a spirit, crazy" also used in Israeli slang), comes from the Arabic root jn - meaning "to cover, conceal". This root is related to the Hebrew גנן - also meaning "to protect, shelter". From here we get magen מגן - shield, and hagana הגנה - defense (which according to Klein was coined by Rashi). The word taw meant "mark", probably as in an agricultural identifying sign, like a cattle brand or the dye mark that modern Near Eastern shepherds daub on their sheep. In Modern Hebrew tav can mean a musical note or a computer character. From the word tav we get the verb תוה - "to make marks, sketch, outline" - and this is the origin of the phrase tvay hagader תוי הגדר - "the route of the fence." We have already noted that tav can alternate with the letters dalet, tet and shin. Additionally, Klein points out that tav as a prefix creates nouns and in doing so interchanges often with the letter mem: תרבית / מרבית , תוצא / מוצא. 1506, "dockyard," from It. arzenale, from Ar. dar as-sina'ah "house of manufacture, workshop," from sina'ah "art, craft, skill," from sana'a "he made." Applied by the Venetians to a large wharf in their city, which was the earliest meaning in Eng. Sense of "public place for making or storing weapons and ammunition" is from 1579. Now I know that the Arabic dar - "house" is related to the Hebrew dira דירה. But is there a Hebrew cognate to sana'a - "he made"? Kaddari also connects the three meanings - the Hebrew "modest", Syriac "cunning" and Arabic "expert, professional". It would seem that a humble person hides himself, while a cunning person hides his plans. And just as in English craft and crafty are related, so too does the astute person know how to prepare things. Stahl quotes a theory that the origin of the capital of Yemen, San'a, got its name from the artisans who lived in the city.